Strathclyde, UK - Gavin Stamp, architectural historian, conservationist and supporter of the salvage trade, died on 30 December 2017. He was a teacher, wrote a monograph on telephone boxes - one of many books, and regularly wrote the 'Piloti' column in Private Eye. The Society for the Protection of Ancient Buildings' (SPAB) policy in 1996 was: 'The use of architectural features from elsewhere confuses the understanding and appreciation of a building, even making untouched parts seem spurious. Trade in salvaged building materials encourages the destruction of old buildings, whereas demand for the same materials new helps keep them in production. The use of different but compatible materials can be an honest alternative.' Stamp called this wicked and drivel. Passion for buildings and architecture has made Gavin Stamp a leading force in shaping conservation thinking over the past twenty years. He has written, taught, advised and inspired the movement to save, and has been totally uncompromising - no excuses, no faint-hearted lapses, no punches pulled – always direct and outspoken. We met in Retrovius’ office in Glasgow (his adopted city) and he was either being coy about his writing achievements or he genuinely did not know how many books he had written or were in the process of being finished. One example is the recently published 600 page Recollections of Sir George Gilbert Scott, to which Mr Stamp has added a critical introduction and Notes, mainly biographical. Aside from the erudite, he also produces the acerbic in, for example, the Nooks and Crannies by Piloti column in Private Eye where he is able to vent off at the crassness of decision makers. As a boy in Dulwich he became interested in the red brick classicism of the school and the mid-Victorian environs of a London suburb. But it didn’t stop there. “I loved the bricks, their texture, redness, and the way they were used. Being in London as a schoolboy I could, and did, wander around the great architecture of the capital. My early interest was gothic - both the old stuff and the revival. It was a wonderful place to be,” and clearly formative. He went on to take a Masters at Cambridge in the History of Architecture, during which time he supplemented the grant with income from the normal student things like Xmas post – as well as a stint in a meat pie factory. “It was terrible. I had to slap lids on the pies, but I couldn’t do it quickly enough.” One imagines pork pies with perfectly formed Soanian domes. And it was the Soanian dome which inspired him to help save the red telephone box which started when, while a member of the Thirties Society (now the Twentieth Century Society) in the 1980s, he heard that British Telecom were bent on destroying these little bastions of English design in the name up revamping their corporate image. As a trenchant conservationist his battle did not end with their demise, but he wrote a monograph, published as a small colour book in 1989 by Chatto & Windus and called Telephone Boxes. The book was one of a series, now discontinued, which included Shopfronts by Alan Powers (then leader of the 20th Century Society), Fanlights by John Sambrook (then running a fanlight business and donor of one for the new Georgian Group HQ at Fitzroy Square), and Drinking Troughs by Philip Davies (then ensconced in the London Division of English Heritage). He currently (1996) teaches history of architecture at the Glasgow School of Art – a part of the University – where he is not a Bannister Fletcher supporter, “I can tell when one of my students has used it, and mark them down accordingly,” although he confesses to running the whole gamut from Egypt to the 1940s, concentrating mainly on style, with structure thrown in where relevant – such as the Norman cathedral builders and the engineers of the Victorian age. He is unable to cover sculpture, except in instances like Michaelangelo, where sculpture and architect were one, and he has no time to get into serious exploration of things like iconography. “The course in Glasgow is an old fashioned chronological progression. Students come in so grotesquely uneducated and often not knowing the basics of history, let alone architectural history, so there is not time to go into great detail. Some of the students do, however, go on to produce very good dissertations." Who are Gavin’s favourite architects today? Page and Park, Ted Cullinan and John Outram. Predictable perhaps, but designers with a questionable approach to detail. Page and Park especially including sculpture in their architecture. 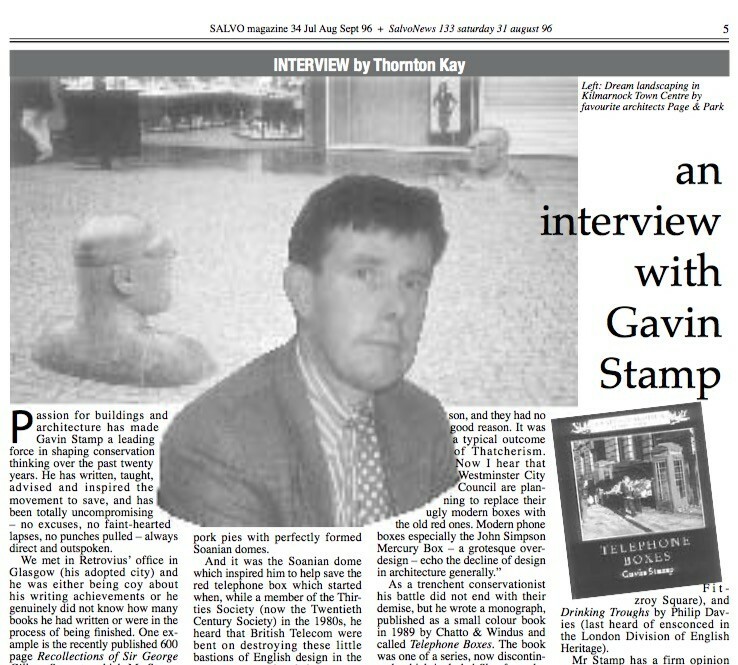 They and Mr Stamp are supporters of Scotland’s finest – the neoclassical present day sculptor, Sandy (Alexander) Stoddard. Who are Gavin’s favourite past and present sculptors? Past is Charles Seargant Jagger whose only major work was the war memorial at Hyde Parke corner, Wittkower described as miserable and I don’t know it (I do now! ), and present is the famous Alexander Stoddart (since 2008, the Queen's Sculptor in Ordinary in Scotland), a fervently Scottish Glasgow-based neoclassical architectural sculptor and modeller, whom Stamp recently wrote about in Perspectives magazine (Prince Charles' now defunct architectural mag). What does Gavin Stamp feel about reclamation v conservation and SPAB? “Well I am member, of course,” he says. On being shown SPAB’s comment about architectural salvage in their manifesto leaflet Stamp explodes. We discussed some of the philosophy of conservation. What did Mr Stamp think about the current social signifance of buildings and sculpture? Was it correct to spend money conserving buildings erected on the profits of the slave trade, prison labour, and so on. Did he have a view on the Chantrey Duke of Sutherland statue controversy? On to listing and the financial overhang being created for future generations. Gavin is on English Heritage’s twentieth century listing advisory group and begins with the EH party line. “Listing a property does not prevent it’s alteration, or even it’s demolition. It merely states that the building concerned has merit and additional procedures need to be followed prior to anything hap- pening to it. I don’t believe there should be any limit on the numbers of buildings listed. We are, in any case, very careful before we list something modern. Personally I am not offended by the amount spent on preserving old buildings and I don’t care about future financial liabilities: that is for future generations to decide. "Traditional buildings will go on forever, so if some money is spent now to repair them, and they are kept maintained, they should not present such a burden in future. Things like the Albert Memorial should also be restored, and £14 million is fine, although perhaps the expected life of the restoration should be considered, it is not something which should be a determinant in whether, or how much, to spend on it now. If it is true that five per cent of the construction budget was spent on repair twenty years ago and eighty per cent now, I am not offended. I do not have a particular opinion. I am confident that such money is well spent. These days, apart from the heritage angle, there is also an ecological one. Value judgements ... value judgements ... I hate value judgements,” he said before pounding off through Glasgow on foot, since he does not have a car and doesn’t believe in them. His resistance may have something to do with the carnage wrought on architecture since the 1950s in the name of the wheeled motorised vehicle. After this interview both Retrouvius and Stamp moved to London. "He had a pragmatic approach," Adam Hills said, "… took a long view … along the lines if you can't save all, save some - for both ecological and well as historical reasons. He was always a great supporter of our activities. Adam and Maria last saw him at Stamp's wedding to fellow architectural historian Rosemary Hill, author of God's Architect (about Pugin), at London's Royal Festival Hall. Incidentally, Rosemary was formerly married to the poet Christopher Logue, another reclaimer, who wrote the screenplay for Savage Messiah and was famously arrested at a small CND demonstration in Parliament Square in 1961. In court he and 23 others refused to be bound over and were sent to Drake Hall open prison where they worked reclaiming bricks from the Royal Ordnance Factory alongside Arnold Wesker, Robert Bolt and Bertrand Russell. Footnote: In case anyone was wondering, it was a coincidence that an ad for SalvoWEB was published in the classified section of Private Eye in December two weeks before Mr. Stamp's death.